Advertising a $0.99 App - Did It "Ad" Up? January 5, 2013 Where in the World is Santa Claus? 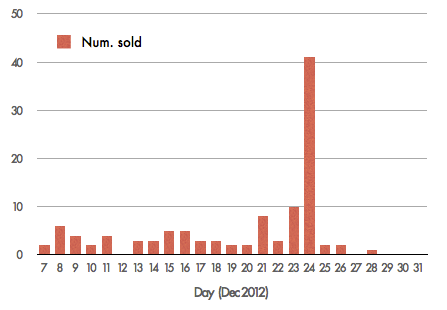 Below are the results of my little experiment in advertising an inexpensive Christmas app with Google AdWords. Advertising ended up costing $1.90 for each $0.50 it produced. Basically, I was losing $1.40 for each advertised click. As my dad said with a wink, “Let me tell you about basic business strategy…” Still, this post is not a slam on AdWords, just some observations on why it did not work in my case. After a hard push, my first app, Santa Snoop (since renamed), made it to the App Store a few weeks before Christmas 2012. I didn’t really expect the app to sell itself. Indeed, without any marketing, it was selling only one or two copies a day. Countless efforts to get coverage from app review blogs would eventually yield one result, and I was pleased to get that. 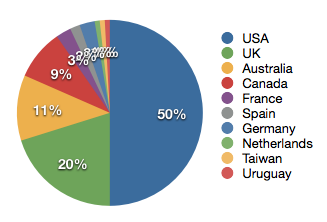 The blog post resulted in about 5-10 new apps sold. You create an ad that gets shown on some Google pages and various other sites, depending on keywords that you provide. If someone clicks on your ad, they get directed to the page of your choice, and you pay Google a small fee. You pay nothing if nobody clicks your link. The exact price that you pay for the click depends on various changing factors, such as your choice of keywords and the quality of your ad, with a catchy ads tending to cost less. You can always control the maximum you are willing to pay for a click. In December, AdWords put my ads on 62,568 web pages. The ads appeared in the United States, Canada, Great Britain, and Australia. The ads appeared only on iPhones capable of running Santa Snoop (iPhones 4 and 5). These ads produced 1,092 clicks. Roughly 1 out of 10 clicks produced a purchase of Santa Snoop. Each click cost $0.19 on average. So it cost about $1.90 to sell a $0.99 app. I was actually earning only about $0.50 per sale after Apple’s cut and taxes. or losing $1.40 per sale. Advertising might work for higher-priced apps, such as $2.99 and up, but even that could be a stretch. AdWords could only get people as far as the App Store page. From there, only 10% made the purchase. Advertising could just work if 50% or more visitors purchased the app once they were in the right place, but that is probably unrealistic. In my case, the numbers did not “ad” up. But $0.19 does seem like a reasonable price to find someone on a compatible iPhone and get them to my App Store page. It was worth a try, at least with the promo deal from Google. Even though sales were slow, AdWords did get over 1000 people from around the world to actually look at my app, which blew away everything else for getting people to the App Store page. Still, came at an unsustainable cost in my case.